What I really wanted was to buy a bass-appropriate blend pedal. Or two. Maybe even three. “If you want a thing done right, buy the pro model and a good road case.” Those are words to live by. And I would have, but there wasn’t one to buy! I found a lot of good pedals that were almost right: A really nice bass crossover pedal with an obvious frequency hole right in the middle of the bass range. Several traditional blend pedals that only do full-range, and one huge blender with tone controls. Like my pedalboard isn’t already huge enough. So I thought: I’ll keep this simple. 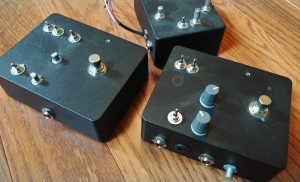 I made simple passive crossovers, and hacked together pedalboards out of hand-made passive crossovers and buffered blend pedals and lots of patch cables. My pedalboard became large. It worked acceptably, right up until the point where I realized I also needed a phase switch. As it turns out, making a phase inverter is a bit more work than a simple passive crossover. At which point I sort of snapped. “I’m an engineer! I’ll just make one!” I thought. And that though quickly combined with “Why stop at just one?” and “Surely there are other bassists out there who have the same problem!” And then I spent all of my New Years break running spice simulations. I could be finished by summer! Within a year at worst. 19 months is a year, right? Design of the crossover and blend circuits went smoothly. “Wow, this is going to be easier than I thought!” I thought to myself in a textbook example of foreshadowing. As it turns out, the actual audio circuit is the easy part. There’s power supply, headroom considerations, and protection circuitry to consider. After two prototypes I gave up on capacitor-coupled designs. 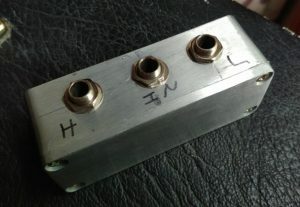 By fall, Sugar Britches had a switching power supply, was DC coupled, and prototypes were on my pedalboard going to shows. This is the reason that the first production model is GB-5…there were 4 prototype designs before this one. There was no need for additional development at this point. I could just quit! But what the heck, I came this far. So I spent the next 7 months getting the packaging and production together, to the point where I’m reasonably happy with the result. Sure, there’s room for improvement. Sugar Britches may not be perfect, but it’s the best damn bass blender available. Web site update: SB is here for real! Sugar Britches now has a web page! Hooray!